What’s the healthiest libation for ringing in the New Year? Beer, says Charlie Bamforth, a professor of brewing sciences at the University of California, Davis. Though it’s been blamed for many a paunch, it’s more nutritious than most other alcoholic drinks, Bamforth says. “There’s a reason people call it liquid bread,” he says. 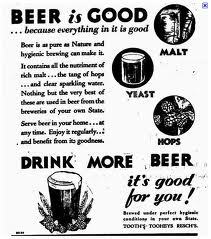 Beer, he says, has more selenium, B vitamins, phosphorus, folate and niacin than wine. Beer also has significant protein and some fiber. And it is one of a few significant dietary sources of silicon, which research has shown can help thwart the effects of osteoporosis. Preliminary research by Bamforth has also suggested that beer may have prebiotics — nourishment for the good bacteria in our gut. As for antioxidants, he says both beer and wine contain them. But, as we’ve reported, resveratrol, the molecule in red wine and chocolate once celebrated as a nutritional key to longevity, may not offer much of a benefit — if consumed in the small quantities we typically get from food and drink. “The way that the wine industry advertised red wine [as healthy], making us think beer just causes beer bellies, was very clever,” says Bamforth. He adds that the antioxidants in wine may also not be as readily absorbed as the ones in beer — compounds like ferulic acid.